Boring sentences? Blah paragraphs? Wanna’ add some BLING to your students’ INFORMATIONAL writing? I will help guide your students in a fun, fast-paced workshop to add sparkle to their writing with strong verbs, vivid details, great leads, cool comparisons, sounds, facts, etc. It’s a perfect recipe for the Common Core! Choose the focus for the workshop: strong verbs, interesting details or writing a great lead. Steve teaches for 20 minutes, the class writes for 15 - 20 minutes, followed by a group critique session led by Steve for the remainder of the time. 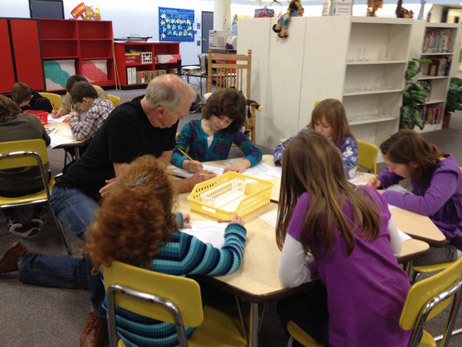 Writer's workshop work best with groups of 25 and under, but are possible with larger groups. Student's need to be prepared with pencil, paper and writing surface. Librarians and teachers from Houston, Texas to Hartford, Connecticut are talking about the emphasis these days on expository or nonfiction writing. Let me help kickstart a passion for writing nonfiction in your young authors by highlighting the basics of using strong verbs and interesting details. Are your students struggling with how to write a good lead or satisfying ending? We'll practice the bookends of a story- writing a solid introduction and good conclusion. 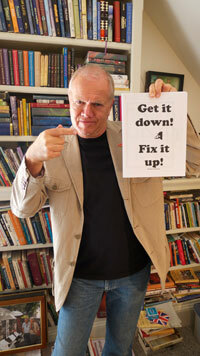 Do your young authors have trouble elaborating on a main idea? This workshops focuses on revising a weak paragraph and enriching the language with specific details that show and don't tell. Verbs are the engine of your sentence. If you remove the engine from your Aston Martin DB5 (thank you James Bond! ), your car doesn’t zip down the road. Likewise, if you take out the verb from your sentence, your sentence does not move across the page. Verbs make the sentence get up and go. And did you know, that you can write with either strong verbs or weak verbs? Why would you ever write "the snake moved across the branch" when you could write "the snake slithered across the branch?" You might also use, crawled, wriggled, slipped, slid, glided. These verbs "SIZZLE!" and are so much better than "moved." Most importantly, they create a word picture in the reader’s mind. The strong verb workshop is action packed. During the 50-minute writing intensive we cover a lot of ground. Students should be ready to work with sharpened pencil and two sheets of lined paper. We kick off the workshop by brainstorming what a verb is, and then we compare weak verbs and strong verbs, we’ll have fun reciting a strong verb poem, we’ll read the first page of a novel and students will try to identify all the verbs they hear in that first page, we’ll conduct a strong verb exercise replacing puny verbs with powerful ones. We’ll finish the workshop with a 15-minute writing exercise where students practice using vivid verbs. In a non-threatening, fun environment students read their pieces aloud (as many students as time allows). Listen to these delicious details in Candy Fleming’s book Amelia Lost. "On May 20, 1932, Amelia took off from Harbour Grace, Newfoundland, the official starting point of the journey. In her cockpit she had some canned tomato juice and a few squares of chocolate, and around her waist she wore her lucky elephant-toe bracelet, the one George had given her weeks earlier. A photographer snapped a few last pictures, and when he begged for "just one more," she obliged and smiled. Then she settled into the cockpit, waved goodbye to the small crowd that had gathered, and roared off down the field. It was 7:12 p.m."
Details and specific nouns add depth and SIZZLE to your writing. Put a clearer picture in the reader’s mind by using concrete information and replacing general words with specific words. For example, instead of writing, "Steve likes candy," try "Steve likes M&M peanuts." I can’t visualize candy in my head, but I can picture "M&M peanuts." Instead of writing, " I heard a noise," you might write, "I heard a scream or a squeak or a rattle or a creak or a moan or phone." The 50-minute details workshop is fast paced and content rich. We will begin with a review of show, don’t tell. We’ll do a little play acting and then try to write with specific honest information that shows, rather than tells the reader what is happening. We’ll read a page from a novel or a nonfiction book with rich language and the students will hunt for the great details. We’ll conduct a detail exercise replacing general nouns such as things, stuff, nice, awesome, with specific details. We’ll finish the workshop with a short writing exercise where students can harness the power of rich details. Students should come prepared with a sharpened pencil and two sheets of lined paper. Hook the reader with a great first sentence. Listen to these engaging beginnings from a few fiction books. "When the doorbell rings at three in the morning, it’s never good news." (Stormbreaker by Anthony Horowitz). "Ma, a mouse has to do what a mouse has to do." (Ragweed by Avi). "Wemberly worried about everything." (Wemberly Worried by Kevin Henkes). "I come from a family with a lot of dead people." (Each Little Bird That Sings by Deborah Wiles). "Me trousers are falling down," cried Dirty George." (Wiff and Dirty George - The Z.E.B.R.A. Incident by Stephen Swinburne). "Where’s Papa going with that ax?" said Fern to her mother as they were setting the table for breakfast." (Charlotte’s Web by E.B. White). Great beginnings draw the reader in; captures their attention; they hook the reader; they make the reader keep turning the page. They SIZZLE! In the great lead workshop, we’ll discuss why are leads important? We’ll listen to a million (well...maybe 20) great leads from children’s books and I’ll talk briefly about how I come up with leads for my nonfiction books. We’ll brainstorm what makes a good lead. Peter Jacobi in his wonderful book, The Magazine Article - How to think it, plan it, write it, says, "A lead attracts attention, establishes the subject, sets the tone and guides or bridges into the article (or book)." We’ll practice writing attention grabbing beginnings. Students will experiment writing various kinds of leads - Sound, Fact, Action, Question and Dialogue. We’ll share aloud as many leads as time permits. Imagine you are a baby sea turtle inside a cue-ball size egg ready to hatch. You are buried under two feet of sand. How would you break free? How would you and your brothers and sisters rise out of the dark nest? What would it be like to boil up from the sandy nest and race across the open beach, dodging sand crabs, scrambling up and down beach hills and finally reaching the tumble of waves? In this workshop, you become the sea turtle hatchling. Obviously, students won’t have time to conduct a lot of research about sea turtles, so Steve leads the class in a brief power-point overview of sea turtle hatchling characteristics, behavior and habitats. Students take notes and list some details about the sea turtle’s environment and behavior. They will also include any cool facts that they learned during the mini-research lesson. Together we’ll brainstorm about the hatchling’s five senses: what does it look like, sound like, act like? Armed with a basic knowledge about sea turtles and a list of some good details and verbs, the student’s write a poem in the first person point of view, as if they were the hatchling. Once completed, students can volunteer to present their poem to the class. If time allows during the workshop, each student will make an illustration about their journey to the ocean. Of course, students can add a visual to their poem later. Steve conducted this workshop recently at an international school in Borneo. Here are some examples from third graders at Pasir Ridge International School. Check out the power of this nonfiction poetry! I am the one in the thousand. determined to break the odds. All my siblings began to celebrate for our successful mission! Finally I break the egg with my eggtooth. so they know it’s time to leave. Crawl, rest, crawl, rest, crawl. We dashed to the wet sand. We nearly touched the sea. But three crabs popped out of the sand to chase me. I crawled as fast as I can. Then I flee to the sea. I’m out of the sandy hole! I’m on the wet sand! Oh my brother and sister! Maybe it’s time to depart. I struggle to achieve freedom. Using my eggtooth to break the shell. Shaking my head to make it fall. It takes two days of hard work to escape the hole. Wait was that a snap I heard. Goal: Using my book, Whose Shoes? - A Shoe For Every Job, as a model, we’ll create a class book about shoes. The book will be illustrated with color photographs taken by students and/or student created illustrations. Steve will show a brief powerpoint presentation about shoes and how he writes a nonfiction book. Each student will have taken a photograph or drawn a picture of someone’s shoes around their house, school or neighborhood. Whose Shoes Will You Wear? I wake up in the morning, Got someplace to go. Whose shoes (will you wear, will you wear, will you wear)? Whose shoes will you wear when you do the work that you do? Could it be a teacher, standing all the day? Could it be a farmer, piling up the hay? What about a rock star, rocking out the beat? What about a short stop, twirling on his cleat? Maybe you’re a singer, dancer, lawyer, captain, chef. Maybe you’re a writer, soldier, doctor, dentist, nurse. Maybe you’re a banker, bowler, baker, billionaire. Maybe you’re a pilot, flying people in the air! Maybe you drive NASCAR, zipping in fast cars. Maybe you’re an astronomer, counting all the stars! Nonfiction Mentor Texts - Teaching Informational Writing Through Children’s Literature, K-8 by Lynne R. Dorfman and Rose Cappelli, Stenhouse Publishers. Nonfiction Matters: Reading, Writing, and Research in Grades 3-8 by Stephanie Harvey, Stenhouse Publishers. Nonfiction Craft Lessons - Teaching Information Writing K-8 by Joann Portalupi and Ralph Fletcher, Stenhouse Publishers. Nonfiction Writing From the Inside Out - Writing Lessons Inspired by Conversations with Leading Authors by Laura Robb, Scholastic. Writing to Explore: Discovering Adventure in the Research Paper, 3-8 by David Somoza and Peter Lourie, Stenhouse Publishers. The Magazine Article - How to think it, plan it, write it by Peter P. Jacobi, Indiana University Press. On Writing: A Memoir of the Craft by Stephen King, Scribner. On Writing Well by William Zinsser, Harper and Row. The Elements of Style by William Strunk and E.B. White, Macmillan. Razzle Dazzle Writing by Melissa Forney, Maupin House Publishing. Easy Poetry Lessons That Dazzle and Delight (grades 3-6) by David Harrison and Bernice Cullinan, Scholastic Teaching Strategies. The Most Wonderful Writing Lessons Ever - Everything You Need to Teach the Essential Elements - and the Magic - of Good Writing (grades 2-4) by Barbara Mariconda, Scholastic Teaching Strategies. 25 Mini-Lessons for Teaching Writing - Quick Lessons That Help Students Become Effective Writers by Adele Fiderer, Scholastic Teaching Strategies. A teacher librarian from Connecticut! "Education, engagement, enthusiasm, energy, and excitment for EVERYONE! This is what you can expect when you invite Steve Swinburne to your school for either an author’s presentation, a writer’s workshop or best of all, BOTH. 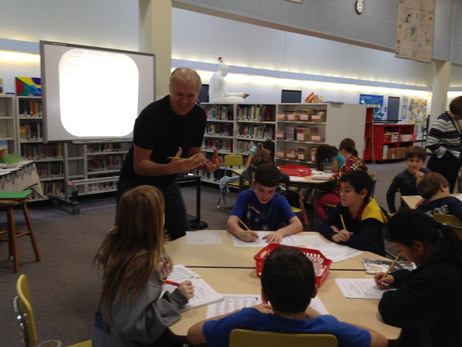 Steve recently visited the Head O’Meadow Elementary School in Newtown, CT for both whole-school presentations and 4 writer’s workshop sessions with third and fourth grade students. What a hit! Students from pre-school through 4th grade and teachers alike were enthralled with his presentations and engaged in his workshops. Why…because Steve brings so much to his work with students and teachers. 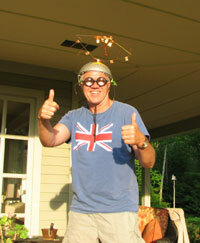 His workshops have just the right balance of teacher and entertainer, adult and child. 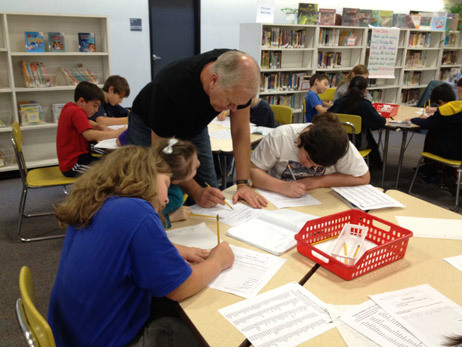 He has fun with the students while involving them completely in the writing process. As the teacher librarian at Head O’Meadow I can attest to the value of having Steve visit. The number of holds I’ve placed on Steve’s books in our library; the desire of several teachers to work with Wiff and Dirty George as a class book with a number of projects planned; the interest students have shown in our writing projects in the library all demonstrate the impact his recent visit has had on the entire school population! Run, don’t walk to your computer and book a visit now; you won’t regret it!" A teacher librarian from Texas! Writing – use of strong introductory paragraphs with examples of ways to create them. Writing – use of strong verbs to enhance meaning. Science – conservation and life cycles of wild animals. Music – rhythms of animal life and sounds. At our February presentation, the students and staff were equally attentive with the animal life exploration, the writing information, and the crowd management skills that Steve built into the program. There were numerous positive comments from students and staff following the presentation. To all teaching librarians I give this advice, "Make it a priority one budget item to include Steve’s presentation as part of your quality library programming for next year". Should funding be a concern, due to the writing elements that he includes in his program, local, state, or federal funding such as Title V could be proposed, approved and allocated to pay for some or all of his presentation and expenses. You would be totally justified in making such a proposal due to the content of the program. Thumbs up for INTERESTING DETAILS! Do you really want your writing to sparkle? Do you want to be totally happy with the story you wrote about your walk in the woods? You can make your story come alive by writing with specific information that shows the reader what is happening rather than telling the reader what is happening. Maybe you’ve heard your teacher or an author say "show, don’t tell." What they mean is try to paint a very clear picture in the reader’s mind. Here’s how it works. Look at these two examples. One is a "telling" sentence and one is a "showing" sentence. Which one is stronger, more alive? "The squirrel was active." OR "The squirrel dashed up the tree, scampered along the branch, flicked its tail, and chatted like crazy castanets." The first sentence tells you the squirrel was active but the second sentence shows you how active the squirrel was. It helps the reader picture the image of a dashing squirrel and hear the sound it makes. By replacing general words with concrete, specific details you can "see" what the writer is saying. Your writing comes alive. A sentence that shows may take a few more words but it’s worth it. If you practice, you get better at turning boring telling sentences into sentences that are alive with strong verbs, interesting details and vivid images. Have fun! P.S. I’m REALLY looking forward to my visit to your school. I can’t wait to meet all you guys! 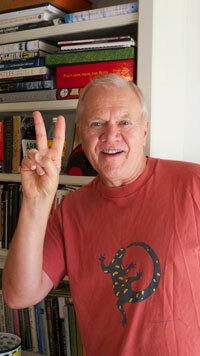 I’m very excited about my three new books for your age: Ocean Soup-Tide Pool Poems; Wiff and Dirty George-The Z.E.B.R.A. Incident and Whose Shoes? A Shoe for Every Job. Here’s a special challenge. You can hunt for the names of characters from Beatle songs, hidden throughout Wiff and Dirty George. If you find all 16 references, you will win a prize. 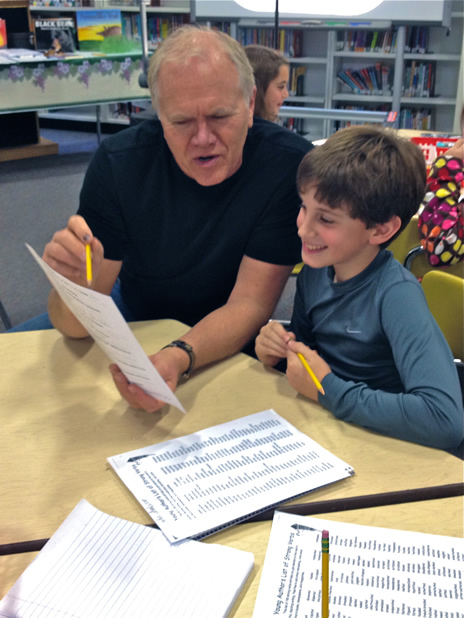 Steve helps a young author at Head O'Meadow School in Newtown, Connecticut, with some strong verbs and interesting details. Mark Twain said: "The difference between the right word and the almost right word is the difference between lightning and the lightning bug." The tips that follow can help your students find the right word when they begin revising a draft. Remember, that first drafts can be messy and usually the writer focuses on getting ideas or the story onto paper. It’s during revision that writers can refine and shape their work. The essayist, Annie Lamotte, pointed out that an engineer has to get the blueprint for a bridge right the first time. Writers, on the other hand, can revise, revise, revise until the piece works. Outstanding writing has strong verbs and specific nouns with only a few adjectives and adverbs. Another great Mark Twain saying is, "If you see an adjective, kill it." What Twain meant was that a specific noun can replace a series of adjectives. In addition, a strong verb can make an adverb unnecessary. - With younger students, you should circle three to four weak verbs such as go, cook, and make. Older students can choose and circle the verbs they want to improve. These verbs are weak because they don’t create an image in the reader’s mind. - Organize students into pairs so partners can help one another. - Ask students to write, in the margin of their paper, several other verbs that are specific and relate to the context and meaning of the sentence and text. So go might become trudge; cook might transform into poach; and make into compel. - Have students choose the best verb from their brainstormed list in the margin and write it above the weak verb. - In first drafts, students writers tend to use general nouns such as things, stuff, time, games. These wide-open words create different images in readers minds--images based on readers’ personal experiences. For example, if i write tree, readers might see an oak, maple, cherry, and all during different seasons. If the writer wants to communicate an exact image, specific nouns help. - Follow the process I suggested for improving verbs, only circle three to four general nouns on students’ work. Once students jot down alternatives, ask them to choose the specific noun that best fits the meaning of the sentence and piece. So, stuff, might become balloons, time might be dawn, and games might be kick-the-can. Making the revision process very specific helps student writers improve their work and tunes them into professional writers’ craft and revision techniques.